Worldtradelaw.net has two aspects. First, there is free portion of the site, which is available to anyone who surfs the web. 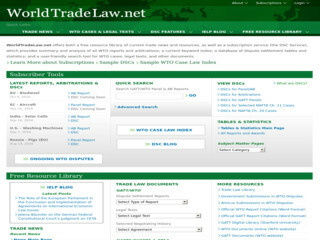 The paid/subscribed aspect of the site consists of several elements, including well organized and easy-to-access primary source documents related to international trade, law; a full text search engine for GATT/WTO decisions, a large collection of links to other sources of information on the web and a discussion form.